TRUMP has lured his followers ever so winningly and seductively into the lusty domain of his fantastically oversized id. On the eve of the first debate between TRUMP and Hillary, as the two are ever so strangely and frighteningly neck and neck in the polls, we must dig down deep and ask ourselves: what in Hell is going on in American politics? TRUMP is like some alien force descended from space morphing and regenerating itself at the speed of light in order to destroy the planet. And it seems he can’t be stopped, no matter how many billions of dollars Hillary throws at the airwaves, no matter how many TRUMPian lies are revealed, no matter how many temper-Tweets he tosses in feverish impulse. It is clear, as the debates are about to begin, that a destructive force hangs like a dark cloud over the electorate, a totally irrational syndrome – XTreme TRUMPology – that is on the verge of destroying America, far, far beyond anything any terrorist could dream. In the age of the post reality, truth no longer matters, the post real “truth” can no longer be differentiated from fiction in the rushing current of falsities that spews from the mouth of Donald TRUMP. He is about to drown us all in the torrent. You see, TRUMP is the master of post “truth,” he revels in it, it is signature state of being, it is where he lives. He has, essentially, stripped down his moral compass to the bare necessities, exposing his naked id – all pure instinct – forging the perfectly crafted lie to close the deal. Up until now, the deal has been strictly financial as TRUMP has weaseled and conned his way into XTreme Wealth. But now that he has infiltrated the world of politics, arguing the ultimate Fuastian deal to his following (the mostly white, bigoted, and uneducated Deplorables), he has lured them ever so winningly and seductively into the lusty domain of his fantastically oversized id, honed through years of shady real estate dealing, serial womanizing, and celebrity showmanship. XTreme TRUMPology resides in the dangerous place of convergence between politics, entertainment and new media. It is here the now anachronistic reasoned policy stance of the traditional pol has been wildly compressed into a 140 character insult bomb that detonates on the screens of his roughly 12 million followers, only to be virally retweeted and rebroadcast into the torrent of the 24/7 news cycle. It’s one big, destructive 140 character nuclear missive blast heard ’round the world. In recent years, the effects of this convergence on our rapidly deteriorating democratic system has been the emergence of a string of celebrities and other “wacko birds” who have conspired to dismantle serious political discourse, replacing it with a comedic series of variety show stunts. So in the wake of this downward spiraling trend comes XTreme TRUMPology, representing perhaps the very nadir, or better yet, the abyss, of a sagging democracy, which now stands the ultimate test of being pushed to its absolute tolerance level before it’s smashed to pieces. Until TRUMP, there seemed to be a certain threshold for the leakage of the celebrity fetish into the political system. But that has changed. 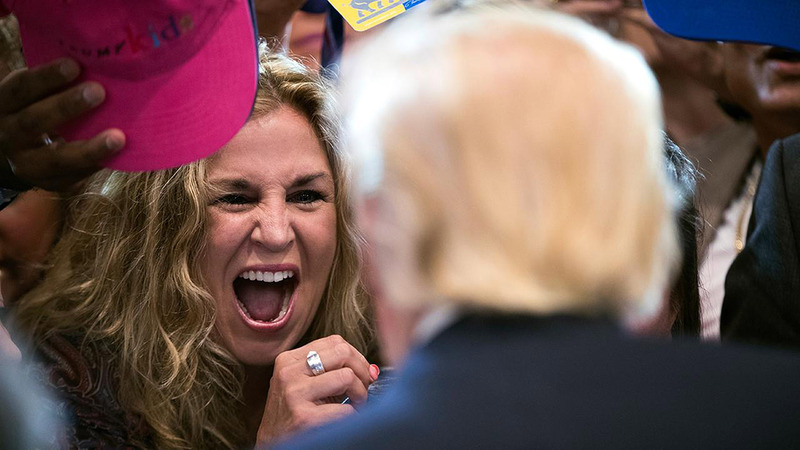 Even if TRUMP loses, the imminent danger of an enlarged id spinning vicariously out of control will never go away, as the dizzying, manic rotation of pop culture twists and turns at the vortex of politics, where it has lodged itself permanently into the American psyche.